For those of you who prefer a shiny Christmas, here's the perfect stocking! Made of red and cream-colored felt and measuring approximately 17 inches tall, this is the perfect place to stash your presents. There's room on the cuff for you to add a name. Personalization is available for an additional $7.00. Please choose your font style using the font guide below, and be sure to double check the spelling of the name for any typos before placing your order. 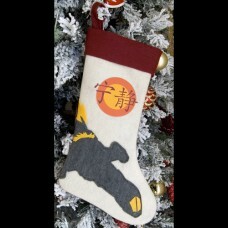 Personalization text will be a golden yellow to match the details on the stocking.